Exterior care is essential because it protects employees, visitors and residents and ensures lasting curb appeal. Pressure washing is an important part of exterior maintenance. Partnering with a company experienced with pressure washing, soft washing, and other building cleaning tasks is the best way to ensure that building maintenance is done correctly and on a schedule that suits your needs. That’s what Sun Brite is here for! How will it pay off? Chips and cracks that eat away at your building often go unnoticed without a good cleaning. 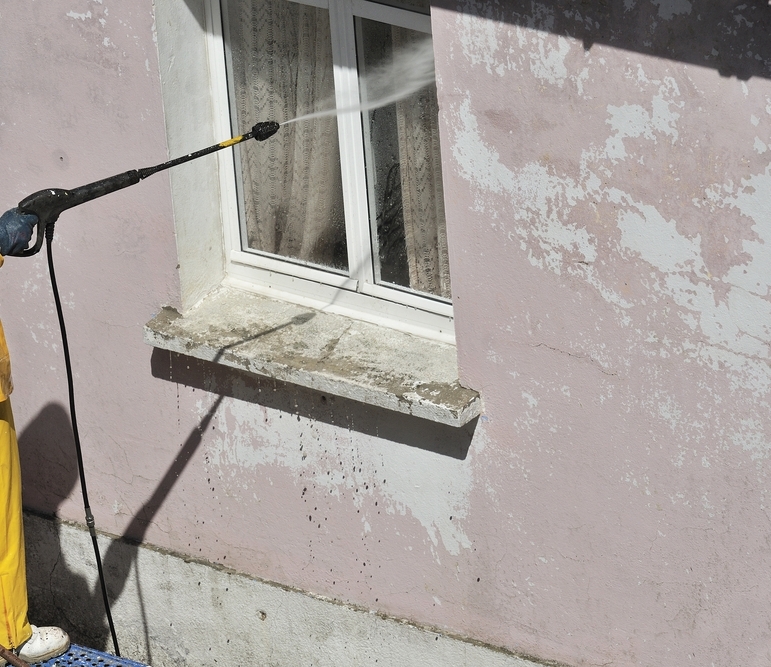 Power washing removes initial growths of mold and mildew. Left unchecked, these require extensive restoration efforts. Windows are kept sparkling clean, which facilitates security measures. It also prolongs the aesthetic life of the glass. Debris that accumulate become a slipping hazard. Regular power washing keeps dirt from building up. Regular cleaning and building maintenance also makes buildings and signage easier to spot from the curb. A clean exterior catches the eye of a potential tenant and tells him or her that your property is clean and inviting. There are some seasons when frequent washings are more necessary. For instance, if rain is likely in spring and fall then washing may need to occur more often. Rain deposits troublesome minerals like calcium, magnesium, and sodium that have to be removed quickly. A service contract is the easiest way of integrating washing services into your existing building maintenance schedule. Service contracts are convenient and often save property managers money, especially over the course of several months. How long will power washing take? Washing does not need to take very long; as subsequent washes occur you will discover that each session takes slightly less time. Simply put, clean buildings are easier to keep clean. Blasting away the accumulated dirt, dust, grease, and grime of several months or years requires a little extra effort. But once this has been achieved, other cleaning sessions will go much faster! We are ready to help building maintenance supervisors address ongoing cleaning concerns. Contact us today at (678) 498-7660 and let’s talk about your property’s needs. The finishing applied to a building will fundamentally affect how it is cared for in the long term. While traditional pressure washing services might work for building exteriors made of brick or vinyl planks, synthetic stucco may be best cleaned with a soft wash. This product, also called dryvit or exterior insulating finishing system (EIFS), provides superior energy conservation to buildings; this feature alone has made it a first choice among many architects and designers. Property managers are sometimes stumped as to how this material should be cared for. Traditional pressure washing certainly removes surface dirt, grease, and grime but is often too harsh for synthetic stucco; as a result, the dryvit starts to break down after subsequent washings. To preserve the natural beauty and dependable performance of the synthetic stucco on your building a soft wash treatment is recommended. In a standard high pressure wash, water is pumped through a pressurized nozzle into a focused spray that is aimed at the surface being cleaned. The high pressure is sufficient to blast away dust, dirt, grease, and other accumulated substances obscuring the actual exterior of a building. The result is a fresh, scrubbed appearance. Brick, concrete, and similarly hard materials can be pressure washed without worry. The pressurized water poses no damage to the surface material. Synthetic stucco is a soft material compared to brick and concrete, but still provides exceptional performance. Detergent is used instead of direct physical pressure to lift dirt and grime from the dryvit surface. First a mixture of water and detergent is applied to the surface being cleaned. Once the detergent has had time to activate, lightly pressurized water is used to rinse it away. The pressure used is no more than what might be generated by a standard garden hose. This is enough force to cleanly remove the soap and grime, yet gentle enough to avoid damaging the synthetic stucco. Every property management firm should know about soft wash services; not every washing company provides this option so it is important to find a company experienced with handling synthetic stucco. We are pleased to offer this option along with our other power washing services. Call Sun Brite today at (678) 498-7660 to discuss your building’s cleaning needs.